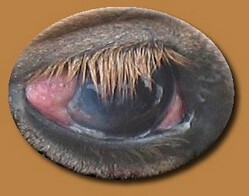 A horse with an early squamous cell carcinoma lesion can be seen with a reddening, roughening or ulcerated area, along with increased tearing of the eye. The tumor soon develops into a small pink or red mass, which if left untreated, can enlarge and spread around and behind the eye, to sinuses, bone, the brain and to other parts of the body. In some of these cases the tumor becomes inoperable and the outcome can be devastating. Squamous cell carcinoma can be diagnosed in its earliest stages by a biopsy of the lesion, which can be performed by your veterinarian or veterinary ophthalmologist. Treatment and prognosis of squamous cell carcinoma varies with the location, size and the extent of the tumor. Treatments may involve surgical removal, freezing or heating, radiation, laser ablation, immunotherapy, chemotherapy or a combination of the above. There is potential for recurrence of the tumor despite the type of treatment used, and additional treatments may be necessary. The prognosis for horses with squamous cell carcinoma is usually good if the tumor is small and can be completely excised. If the tumor is large and extensive, or involves the eyelids or the space behind the eye, the prognosis may be poor. The following are recommendations to minimize your horse’s risk of squamous cell carcinoma: avoid peak sun exposure between 10 a.m. and 3 p.m.; provide protection of the eyes from insects, dust and wind by using an ultraviolet protective mask, sunscreen and fly repellent.